What It’s About: Boris Karloff introduces three tales of terror. In The Telephone a woman named Rosy (Michele Mercier) is getting ready for bed when she starts receiving creepy, sexual phone calls from Frank (Milo Quesada), an ex-lover that she sent to prison who recently escaped. The caller seems to know exactly what Rosy is doing at all times, so Rosy calls her ex-lover Mary (Lidia Alfonsi), who agrees to watch over her. Is Frank really at large? The Wurdalak: Vladamir (Mark Damon), a traveler in rural 18th century Russia, finds a decapitated body on the road. At the nearest farm, he is told the body was a Wurdalak, a vampire that preys on those it loved most in life. Gorca (Karloff), the patriarch of the farm, left five days earlier to slay the Wurdalak, instructing his family to kill him if he takes longer than five days to return. When a pale, wounded Gorca arrives just after the stroke of midnight will the family have the strength to kill him? Can Vladamir lure Gorca’s beautiful daughter Sdenka (Susy Andersen), away from the family to safety? The Drop of Water: A woman named Helen Chester (Jacqueline Pierreux) is called by a superstitious neighbor (Harriet Medin) to dress the corpse of the lady of her house. The lady was very old, friendless, and obsessed with spiritualism and seances, but Helen is not superstitious at all-and takes the opportunity to steal a ring from her corpse. Unfortunately, when Helen returns home to her apartment she finds that maybe she could have benefited from some superstition…. Why Watch it Today? : Mario Bava, the cult favorite Italian genre film director of the 50s-70s known for his eye-catching use of color and ability to create chills on a tiny budget, was born on this date 100 years ago. 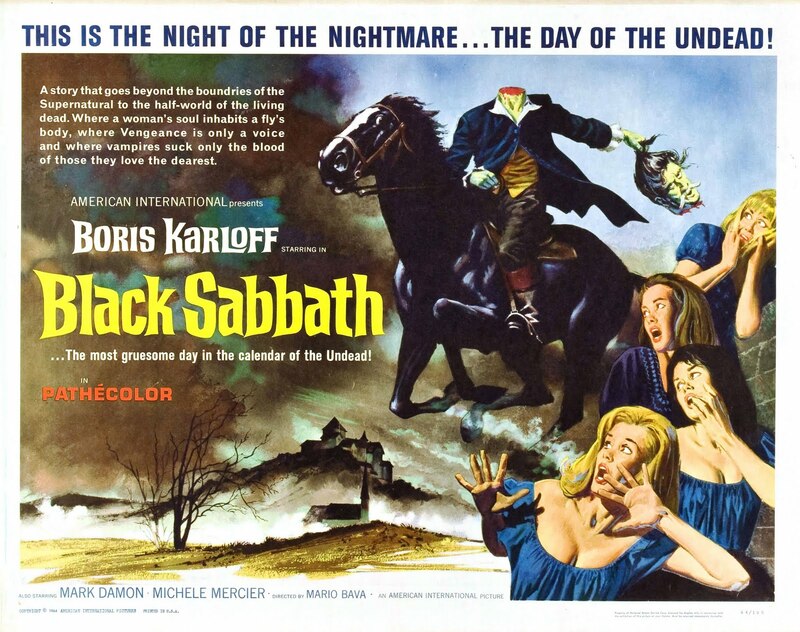 Black Sabbath is best seen in the original Italian cut-AIP released it in English, scrambling the order of the stories (putting the last first, the first second, and the second third, and spoiling the gradual building of mood needed to make The Drop of Water work) and shooting new, inferior bookend segments with Boris Karloff and using a new lounge score by Les Baxter. Other Choices: We’ve previously featured Bava’s classic gothic chiller Black Sunday, his horror black comedy Hatchet for the Honeymoon and his trippy Lisa and the Devil as Movies of the Day and reviewed his Agatha Christie giallo variant 5 Dolls for an August Moon. This entry was posted in Anthology, Ghost, Gothic Horror, Horror, Independent, Movie of the Day, Period Film, Stalker, Thriller, Vampires and tagged "scared to death", AIP, Boris Karloff, breaking the fourth wall, Britain, co-production, corpse, Drive-In, family, father, France, ghost story, Italy, Les Baxter, lesbian, maid, Mario Bava, Mark Damon, obscene phone call, pimp, Russia, telephone, vengeful ghost. I hated this film the first time I saw it because it was that mangled AIP cut that makes the movie annoying (that Baxter score was also problematic for me). Years later, I saw the original version and it was like a puzzle coming together right out of the box. Hmmm… have you seen Bava’s Twitch of the Death Nerve, Danger, Diabolik or Planet of the Vampires? I have seen all of those, though it’s probably been over ten years. I actually saw Planet of the Vampires as part of a 24 hour Sci-Fi marathon and the crowd wasn’t kind to it, so I’d love to see it again. Likewise I’ve only seen the MST3K of Diabolik. I liked but didn’t love Twitch…I know how important it is but it just didn’t do it for me. I’ve actually seen a lot of Bava; at some point I’m sure to get to The Whip and the Body, The Evil Eye and Rabid Dogs, though I last watched many of them long enough ago, and just once, so I may wait until I’ve watched them again. Over time I’ve found Bava is best in small doses as opposed to a whole block of his films. Too many of his movies in a row can get tiring unless you go in looking for his craft and how he did certain visual effects on the cheap (Planet of the Vampires is great for that bit of study). Twitch makes me laugh when i see it because it’s nodding and winking at the audience. Diabolik is “better” than that MST3K version, but it’s also a tricky viewing experience on a few fronts.